The Beacon XV Hotel is located in Boston, in the state of Massachusetts in the United States. This hotel has an antique design with integrated technologies and art works. The hotel is located in an historic building dating from 1903 on Beacon Hill. The hotel has a vast territory located in the central business district right next to the historical centre and near many of the city’s landmarks. 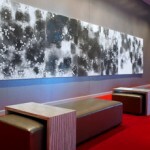 The designer décor is present throughout the hotel, from the mahogany reception to the halls filled with artworks. The building has an elevator almost identical to the building’s first elevator, which in turn was one of the first ones in the country. The hotel has a media library and guests will be able to enjoy a wide range of music directly in their rooms. Each one of the 62 rooms at the hotel comes with a fireplace. The rooms have plenty of natural light, wooden floors and furniture upholstered in materials of varying shades of gold. Each room has a queensize bed and cotton bed linen. There is a spacious working space with natural light. 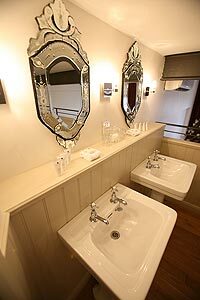 The hall leading to the bathroom has a table with fresh fruit, and the bathroom itself is made from Italian marble and has make up and shaving mirrors, huge towels on heated towel rails and thick bathrobes for each guest. There is a television, a jacuzzi and a separate cascade shower in the bathroom. The beds are four poster beds with curtains and are covered by cashmere covers. 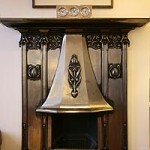 Next to the bed there is a control panel that controls the chimney and the music. The working area has a fax machine and three telephone lines. The 27 inch television screens come with a wide selection of films and have Internet access. The minibar in each room is stocked with all kinds of refreshments. The Classic rooms cost 291€ per night. The Studio rooms are more spacious and cost 404€ per night. 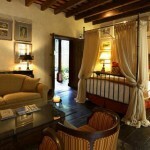 The Suites have a bedroom and a living room, with a price of 883€ per night. Those guests who travel as a group or for an event can rent a whole floor for 2756€ per night. Guests will be able to enjoy the hotel’s personalized service. After their arrival, guests receive personalized business cards that state their room number, telephone and contact details and their arrival and departure dates, a service designed for those who travel on business. Pets are allowed at this hotel, and these furry guests are provided with bowls filled with snacks and blankets for cats and dogs upon their arrival. If it rains during the stay, guests can use the complimentary umbrellas. Guests who have to travel around Boston can use the hotel’s chauffeur service. The hotel has a fleet of Lexus cars that can take guests all around the Boston area. The hotel has several conference rooms, each room having a capacity of up to ten people. All conference rooms have a private bathroom, leather chairs and a fireplace, and iPads and other technological items can be rented for events. The hotel’s Mooo restaurant is decorated in the latest fashion with elements dating for the start of last century. This restaurant serves all kinds of gourmet dishes. Guests will be able to enjoy a delightful meal either at the restaurant or directly in their rooms. The wine cellar dates from the time this hotel was still a large private mansion. Private events such as dinners of up to 40 people can take place here. The Pera Palace Hotel is one of Istanbul’s most famed and historic hotels, dating back from the times of the Turkish Empire. This centric hotel dates from 1892, when it was built for passengers of the Orient Express. This special category hotel can be considered as a museum hotel. The hotel is located in the Beyoglu district, a centric historical neighbourhood of the city, and is the oldest European hotel in the country. 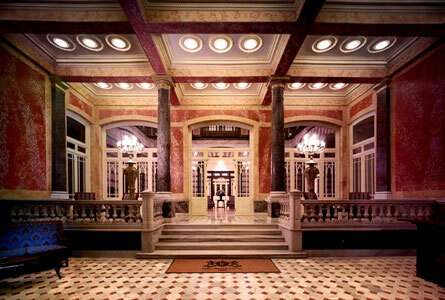 The hotel has art nouveau elements with a touch of neoclassical and oriental style. The hotel officially opened in 1895. During many years, guests who arrived at the city by the Orient Express stayed at this hotel, and because of this the logo of the hotel is the same as the one of the Orient Express. 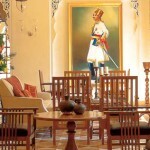 During the last century the hotel has lived through the fall of the Ottoman Empire and two World Wars. 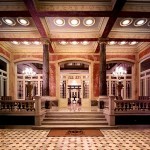 During the First World War the hotel was used as the main headquarters by the occupying forces. This building was the first building to have electricity, which was only used in palaces at the time. The hotel has 99 rooms and 16 suites. All rooms are double rooms with a spacious bathroom. The rooms have been renovated maintaining the same style they had all those decades ago when both royalty and celebrities stayed here. Mustafa Kemal Atatürk, the first president of Turkey, stayed in Room 101. In 1981, to commemorate the hundredth anniversary of his birth, the rooms was converted into the Atatürk museum, where visitors will find authentic antiques dating from 1917 and personal amenities that belonged to the man who founded the Republic of Turkey. The room is painted in a light sunrise pink, his favourite colour, and is decorated with ancient Turkish and international books of great value and collections of magazines, post cards, medals and other antiques. Other historical figures who at some point stayed at this hotel are King George V, Kaiser Wilhelm II, Zar Nicholas II and the Austro Hungarian Emperor Franz Joseph, and many others. Even personalities such as Great Garbo, Rita Hayworth, Jacqueline Kennedy and Zsa Zsa Gabor enjoyed a stay at this hotel. The Deluxe Pera View rooms have views towards the famous Petits Champs street. These rooms can have either a kingsize bed or two large individual beds, and the bathrooms have either a bathtub or a shower. Some of the rooms have their own French balcony. Each room is decorated with crystal ornaments and has a lot of natural light. Price is around 155€ per night. The Deluxe Golden Horn View rooms have views towards the Golden Horn. 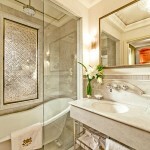 The bathrooms are made of marble and most rooms have a private French balcony. Price is 195€ per night. 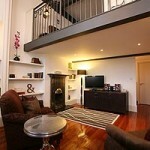 The Grand Pera Studios have views towards one of the city’s main streets, Les Petits Champs. Guests will be able to enjoy views towards the centre of the city, which has many buildings and historical monuments, from the large sofas in their living rooms. The room is connected to the bathroom, which has both a bathtub and a shower. Room 411 is known as Agatha Christie’s room. The Queen of Crime stayed in this particular room several times between 1926 and 1932. Several urban legends claim that this hotel was the place she spent the 11 days she was missing, and half a century after that incident a key to one of her still missing diaries was found in this room. This rooms is one of the most booked rooms at the hotel, and guests will have to book in advance if they want to stay at the place where she wrote Murder on the Orient Express. 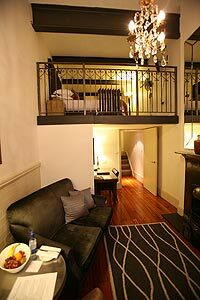 The six Greta Garbo rooms are 50 square metres each, and have small French balconies with views towards the Petits Champs. The Swedish actress stayed in these six rooms. Price starts from 270€ per night. 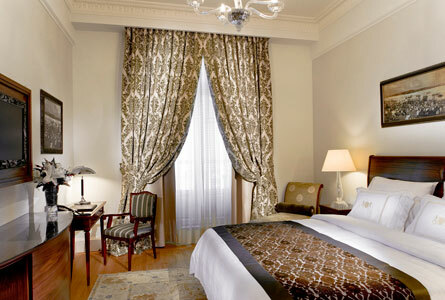 The Pera Palace Special Suites are decorated with paintings, antique furniture and designer carpets. The large marble bathrooms have a bathtub and a shower. Most suites have French balconies, and each suite is named in honour of an historical figure who stayed at that room. Price varies according to the suite, with the minimum price being around 445€ per night. Five suites are known as the Ernest Hemingway suites. The writer stayed here in 1922. The 55 square metre suites have a bedroom, a bathroom, a closet, a living rooms and a French balcony. 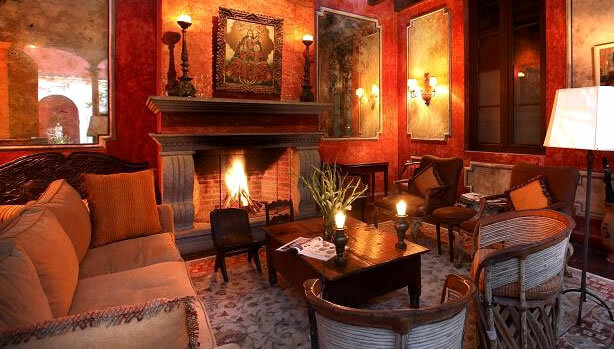 The Pierre Loti suites were some of the French writer’s favourite places. The suites are located on the corners of the building and have different views. The suites have a bedroom, a bathroom and a living room. Suite 201, the Ismet İnönü suite, and Suite 301, the Celal Bayar suite, are senior suites named in honour of the second and third presidents of the Republic of Turkey. These suites have large balconies with views towards the Golden Horn. 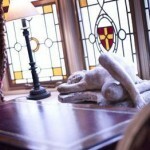 Each suite has a large bedroom with a marble bathroom and a separate working area. The Piano suite is located on the sixth floor and has views towards the bay. 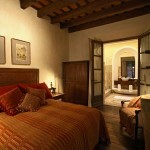 The suite is decorated in an Art Déco style, and has a large bedroom, a bathroom and a living area. 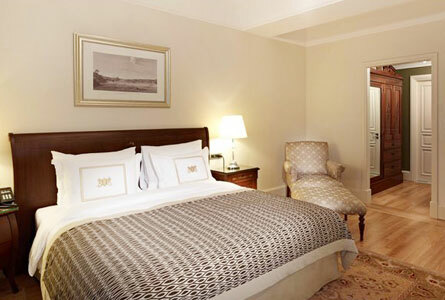 The Presidential suites at the hotel are known as the King Edward VIII suite and the Franz Joseph suite. These suites are located on the fourth and fifth floors of the hotel. Each suite has 155 square metres, with a bedroom, a closet, a large living room area, a dining room, an office and two bathrooms. The reception, hallways and rooms at the hotel are covered in white marble and are decorated with Murano glass chandeliers that hang from the ceilings. New technologies have been integrated without disrupting the design. The hotel has conserved its XIXth century style, and little has changed in its décor. The elevator has been renovated conserving the same structure that the first elevator installed at this hotel had. The hotel’s restaurant, Agatha, combines the traditional cuisines of the three cities where the Orient Express stopped, Istanbul, Paris and Venice. Guests will be able to savour dishes from the French, Italian and Turkish cuisines. The restaurant has an open kitchen and its own wine cellar. The Orient Bar remains one of the city’s most trendy bars. Many historical figures and celebrities have enjoyed a night out at this bar, which is known for its Oriental décor and its cocktail and wine list. The Kubbeli Tea Room Saloon can be rented for private events. This room has high ceilings, large windows and a piano. Many guests come to this tea room during tea time, and live music is played during the afternoons. The hotel has an historical bakery, the Pâtisserie de Pera. This pâtisserie serves fresh croissants and ground coffee. Guests and visitors will be able to enjoy home-made cakes, chocolates and pies from both France and Turkey. The hotel has a 380 square metre spa where guests will be able to enjoy traditional Turkish baths. The spa has a gym, a swimming pool, several saunas and Turkish baths, and there are massage rooms. There are several renovated conference rooms which combine design and technology. The conference rooms have high ceilings and plenty of natural light. Some of the rooms can be divided into smaller rooms. The hotel has views towards the Golden Horn, an estuary that divides the city, and part of the peninsula. The hotel is located in one of the city’s oldest districts, where people of European descent used to live, which explains why the area is known as Little Europe. Nowadays the neighbourhood is one of the most visited places in the city, and has many bars, restaurants and a variety of museums. The hotel is located a short distance away from the main streets and main squares, such as Istiklal Avenue and Taksim Square. There are many shopping centres, open air markets selling carpets, jewellery and spices, and traditional restaurants nearby. 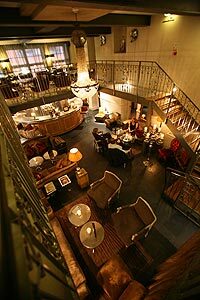 The Le Seven Hotel is located in the City of Lights, Paris, France. This hotel has a minimalist décor and the latest technologies, with beds and bathtubs that float in the air. This hotel is part of the chain of hotels responsible for creating the emblematic The Five Hotel. This particular hotel has its own design. At a first glance, this hotel seems to be an upper scale boutique hotel with double rooms with large flat screens and large bathrooms. Behind the now common iPod docks there lies a minimalist, carefully thought of décor designed to ensure each guest’s tranquillity. There are several types of rooms, where each rooms has its own, slightly futuristic design. The hotel envelopes one right from the reception area. A huge 3D screen filled with bubbles stands in the centre of the lobby, allowing visitors to have a glimpse and a virtual tour of the hotel. The personnel offers guests a guided tour around the hotel’s common areas and tells them the story of the creation of each room. Next to the lobby there is a large bar with a serious, modern looking design, with LED lights that change colours according to the time of day. All the rooms have a Nespresso coffee making machine. There are several iPod docks for all kinds of Apple products. The large plasma television screen has several international channels and the remote control has four buttons that allow guests to choose the fragrance that they want their room to smell of. Each room and suite provides guests with bathrobes, a large safe and a separate, well lit working area with a desk and chair. The 28 Levitation rooms look like standard rooms at a first glance. It only takes a few moments to realize that this is an illusion. The large double bed is actually a couple of inches above ground. The shower is illuminated in different colours, as is the modern bathroom. Price starts from 153€ per night. The Absolute Levitation rooms are slightly more spacious double rooms which have a large floating bed right next to the glass, colour illuminated shower. Price usually starts from 185€ per night. The Suspended Bath suite is one of the hotel’s most wanted suites. The double beds in the suite are covered in bright white linen and float several centimetres off the ground, while the large black bathtub floats in another corner of the room. This rooms is painted in dark colours and has a minimalist décor, veiling the suite in mystery. The floating bathtub for which the suite is named is made of black stone and can seemingly shine, depending on the light. Price is 233€ per night. The Close to the Stars Suite and the Touching the Stars suite are located on the hotel’s top floor and have views towards the city. The ceiling in both rooms is covered in a dark cloth and filled with small lights representing the stars and forming constellations. Guests who stay in these two rooms will be able to enjoy views of the city centre and the sky of Paris, since one of the windows is in the ceiling. These suites cost 233€ per night. The Black Diamond suite is decorated in black. The kingsize bed, the rest of the furniture, the curtains and the bed linen and even the mirrors are black and are decorated with thousands of crystals which reflect light and create a luminous sparking effect. The bathtub is made from black stone, with Swarovski crystals en each corner. The large shower has a hydromassage column and glass decorations on the ceiling. The black carpet covering the floor has golden accessories and optical fibres that can be lighted. The Marie Antoinette suite has a boudoir and a deluxe décor, representing Marie Antoinette’s lifestyle had she lived at the start of the XXIst century. This large rooms has a psychedelic edge to it. 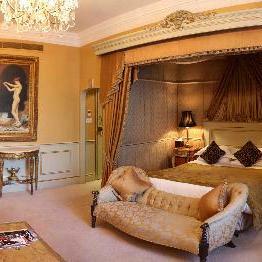 A huge bed which looks like a throne stand in the centre of the room, which is filled with elaborate chandeliers. One of the room’s corners has been transformed into the living room with sofas. The bathroom is decorated with mirrors similar to those at the Versailles Palace, and both the shower and the bathtub are covered by pink optic fibre. 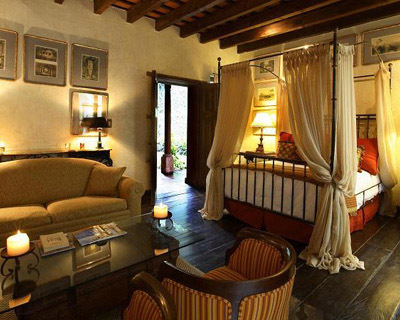 The Sublime suite is one of the hotel’s honeymoon suites. It is decorated in different shades of white and a large circular bed stands in the middle of the room. A thick carpet covers the room’s floor. The ceiling above the bed is decorated with tiny lights and futuristic lights that looks like stars. The suite has a lounge area with classical style furniture and a sofa. This suite’s bathroom has a futuristic design, with bright lights and a bathroom that looks like a cocoon. The 007 suite is decorated in honour of the world’s most famous spy, Bond, James Bond. This suite has a retro touch mixed with some futuristic designs, just like Mr. Bond’s classical stance was always backed up by the latest technological inventions. Guests who stay in this room will be able to watch all the James Bond films on the giant television screen. This suite has a kingsize bed and a lounge area with a sofa and a coffee table. 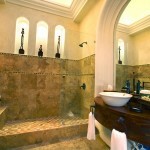 The bathroom has a shower which can be transformed into a Turkish bath. The On/Off suite is the star suite at the hotel. At a first glance this suite has a simple, minimalistic décor. One needs only to turn on the lights in order for the room to transform itself. Once the light is on, the white walls suddenly become all shades of the rainbow and surreal designs appear along the suite. 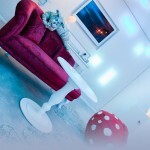 The Alice suite allows guests to enter Wonderland. One of the walls is decorated with clocks of all shapes and sizes, including clocks where time goes backwards. Several different lamps hang from the ceiling. The walls are covered with plush imitations of Caroll Lewis’ characters. The bathroom has two toilets with a chess board between them. The lounge area of the suite has a bright red sofa and many plush toys, and the room can change its colour if one changes the light. All of these suites cost 505€ per night. The Lovez- Vouz suite is the largest one at the hotel. The design features the importance of ecological tourism and all of the ornaments honour Mother Nature, such as stone and wood floors and wooden and leather furniture. The master bedroom has a large round bed and a television screen, and there is another screen in the living room. This suite has a fireplace. There are two bathrooms, one of them with a shower for two and the other with a bathtub covered in cow hide and direct access towards a private terrace with a Jacuzzi. Price is around 801€ per night. The hotel is open all year round. The hotel is adapted for people with disabilities and the reception works 24 hours a day. Laptops can be rented for the length if the stay, and guests can use the fax and photocopy machines. The hotel offers laundry service and room service. The hotel has a lounge and a restaurant on its ground floor. Guests will be able to enjoy delicious tapas and a wide selection of different wines. This hotel is located in the 5th arrondissement in Paris. The hotel stands in the centre of the Quartier Latin, one of the city’s most cultural and historical neighbourhoods. Guests will be able to enjoy the local food at the many nearby cafés and restaurants. The area has many art galleries, and only a couple of minutes away guests with find an ancient amphitheatre, Les Arènes de Lutèce. Two of Paris’ best known places, the Jardines de Luxembourg and le Jardin des Plantes, are only a couple of minutes away. Other places such as Saint Germain, the Montparnasse Cemetery and the Notre Dame Cathedral are within walking distance. The Gore Hotel is located in London, Great Britain. This hotel is in one of the city’s most fashionable areas and dates from the XIXth century building which still conserves the classic Victorian décor and façade. According to a legend, when a new law prohibited any hotels in the area, the family transformed their mansion into a large guest house. With some of the many rooms allotted for guests, the guest house managed to evade the no hotel law until it was no longer valid, and by this time the mansion was legally transformed into one of the city’s best hotels. Even nowadays the hotel is one of the favourite places to stay of many visitors and celebrities who seek some quiet time away from the hustle and bustle of everyday city life. The hotel has 50 rooms which vary in size. The Double Queen Rooms are smaller rooms with a queensize bed, while the Tudor rooms are the most luxurious rooms at the hotel. 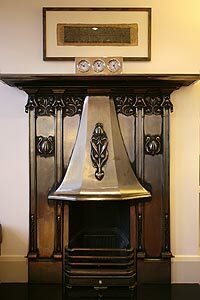 There are several types of rooms at the hotel, such as Queen Double, Wonderful Double, Luxury Double, Deluxe and Tudor, all of them double rooms with a private bathroom and somewhat Victorian ornaments. All rooms have several characteristics in common, such as television sets and carved furniture coupled with an antique décor. The bed linen, towels and bathrobes belong to the Frette brand. The Wonderful rooms and Queen rooms are standard double rooms. 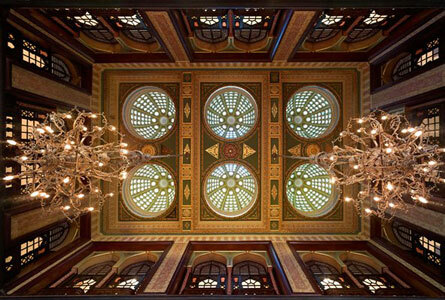 They are decorated with large gilded mirrors, sparkling chandeliers and antique style furniture. Price is around 180€ per room per night. 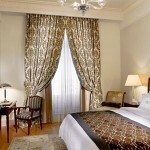 The Luxury Doubles are more spacious rooms which have a similar decoration to the standard rooms. These rooms hold huge oak beds and are equipped with more amenities than the standard rooms, which means that price per room is higher, at 219€ per night. The Deluxe rooms are large rooms with plenty of living space. Each one of these rooms has a different theme and decorations, and a room costs around 270€ per night. The Lady Blessington room is decorated according to the taste of this lady who stayed at the hotel during the Victorian era and organized many intellectual soirées for famous writers, such as Charles Dickens or Hans Christian Andersen. The room has an enormous bed with a mirror on the headboard, and it’s adjoining black marble bathroom has a separate shower and bathtub. Miss Ada’s room used to be the room of one of the first owners of the hotel. This comfortable room is best known for its bathroom, a mahogany covered room with a throne in the middle. The master bedroom is decorated in what is traditionally seen as a Victorian style. Miss Fanny’s room is the room that used to belong to Miss Ada’s sister. The main bedroom is full of brightly coloured curtains, carpets and upholstery coupled with antique portraits, while the bathroom is decorated in a Victorian style with mahogany panels and a throne. The Judy Garland room is one of the most luxurious rooms at this hotel. The bedroom holds a large, carved, wooden bed covered in golden paint, and the decorations in this spacious room have a touch reminiscent of a Wizard of Oz scene. The bathroom walls are covered in hand painted tiles. 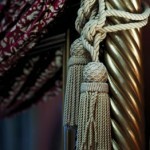 The Dame Nellie room is a grand room decorated with gilded furniture, intricate ornaments and heavy velvet curtains. This room is named in honour of a XIXth century artist, and because of the hotel’s proximity to the Royal Albert Hall, over the years it has become one of the favourite rooms for musicians and other artists to stay in. The bathroom has a huge marble bathtub flanked by statues of Venus and Adonis. Price is around 430€ per night. The Tudor room is an enormous room fashioned in the same way the grand mansions were decorated during the reign of the Tudors. This room has high ceilings, elaborate chandeliers and a huge stone chimney. There is antique furniture stationed around the room under huge portraits. The adjoining bathroom has a separate copper shower and a large clawfoot bathtub. The hotel has its own bar, Bar 190, and a small bistro, Bistro 190. 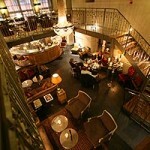 Both serve a mix of typical dishes from several European countries and have a Gothic interior. Private areas can be reserved for private events and special occasions. There are three air conditioned meeting rooms at the hotel. These spacious rooms have XXIst century technological gadgets discreetly integrated in the XIXth century décor. The Tapestry room is a large meeting room with two chimneys and gilded portraits hanging both in the lounge and in the library. 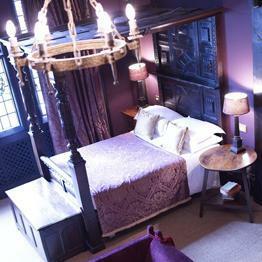 The Mulberry room is the most formal hall, with wooden panels and decorative chandeliers. 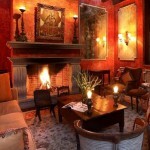 The Green room is a traditional conference room with a capacity of up two 18 people, a fireplace and a small library. Right above the hotel’s impressive staircase guests will find a small balcony which has been remodelled into a business centre. Guests will be able to use the computers, fax machines and printers. The hotel is located between Kensington and Knightsbridge. Guests will be able to stroll in Hyde Park or visit some of the nearby museums, such as the National History Museum. The hotel is only a few minutes away from Harrods and the Royal Albert Hall. The W chain of hotels is one of the most luxurious hotel chains in the world, located in the most important cities in North America and Europe. All the hotels boast a luxurious fusion between innovation and design. The W Hotel Hollywood is one of these unique and stylish hotels. The hotel is located in the centre of the internationally renown Empire of Cinema, Hollywood, and is in sync with the never relenting rhythm of the city. With its grand restaurant, spacious rooms with modern furniture and stylish designs, the hotel is considered to be one of the best in the city. The hotel has several types of rooms, all of them very spacious with a double bed, a marble bathroom with an in room spa, and modern decorations. The rooms boast large flat screen television sets, Internet access and all kinds of amenities that will make the stay at the hotel a comfortable and memorable one. The hotel has 305 rooms and suites, and each type of rooms has a different décor. All bathrooms have a wide selection of spa amenities and products, while rooms have the best technology available as well as the traditional Munchie Box, a large box full of all kinds of snacks. 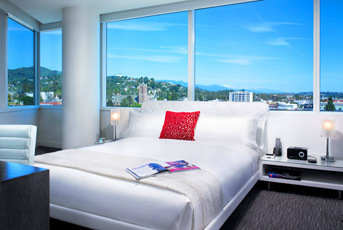 Rooms have views towards Los Angeles, and the luxurious details are enough to make one feel as a real star. The hotel is one of the most ecologically friendly hotels in the city. All the technological gadgets have been designed to create a green environment, with larger windows allowing for more natural sunlight, special coated windows allowing the room to lose less heat and low energy light bulbs. All the rooms have a large collection of movies available, as well as iPod docks, hypoallergenic pillows, a smaller make up and shaving mirror in the bathroom, plug adapters, alarm clock with radio, tea and coffee machines, free mineral water, a mini bar, extra beds, a safe, a working desk, a full length mirror and a bed for pets. The hotel also provides guests with warm bathrobes during the length of their stay and umbrellas in case of rain. The Wonderful Rooms are known for their vistas, as well as for their retro décor, with vinyl sofas near the enormous windows. Each room has a flat screen television screen as well as a dozen of other technological gadgets in every corner of the room. 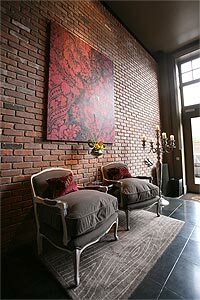 Each room has a modern, comfortable lounge area with ottomans. 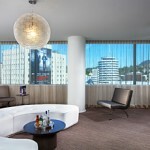 Spectacular rooms have views towards the world famous Hollywood sign standing on the Hollywood hills. These rooms have large windows with window seats where guests can relax while enjoying the views. These rooms have a lounge near the master bedroom, as well as a separate working area full of modern technologies. The Fabulous Rooms are more spacious rooms with a modern design and views towards the most famous Los Angeles neighbourhood. These rooms have a sitting room area with a small sofa near the windows, as well as a separate working area with a brilliant white desk and a media library with many books, musical genres and movies to choose from. The Marvellous suites have a large master bedroom, a sitting area with a sofa shaped like a semicircle, and a futuristic décor. Each suite has all the latest technological details as well as the traditional W double bed with many cushions piled on top of it. 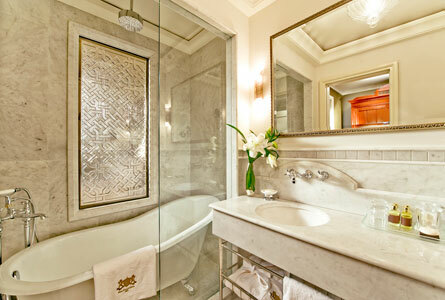 The bathroom of each suite has an enormous bathtub, while the separate sitting area has its own bar. 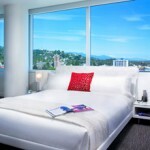 The Corner Cool Suites are luxurious suites with a gigantic master bedroom located on the corners of the building. 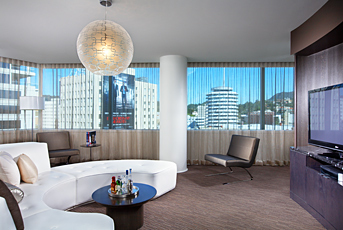 The suites have views towards the Hollywood sign on one side and the city of Los Angeles on the other side. The living room has a large sofa shaped like a semicircle, a flat screen television set with home cinema and other technologies, and there is a separate spacious working area with a telephone and a small business centre. These suites are decorated in pure white and furbished with contrasting dark wooden furniture. The Fantastic Suites are the most technologically advanced rooms at the hotel, with a panel that controls the lights, climate and the windows. They are decorated as though they are a supehero’s lair, with a large bed on a dais in the master bedroom, two bathrooms, one of which has a bathtub for two, and a private terrace. The sitting room has a large television screen, several iPods and iPod docks, CD and DVD machines, a large media library and a small conference room with a table for up to eight people with all the necessary audiovisual equipment. The Wow Suites can be considered the hotel’s visiting card, and are renown for their Oscar worthy décor. These suites have a private terrace with a decorative chimney in the patio, a large dining table for ten people and views towards the City of Angels. In the master bedroom guests will find a large double bed on a dais, while in the bathroom they will find a Jacuzzi with a mini spa. These suites have disabled access. There is an extra guests bathroom. The sophisticated living room boasts a giant sofa with several armchairs, and has a classical luxurious décor, with pearl grey walls and hardwood floors. The room has a panel which controls the intensity of the lights, a flat screen television set and thick carpets. Guests who stay at these suites will be able to use their own private kitchen, and those who travel on business will be able to use the large separate working area which has a hand carved working desk and all kinds of technological devices. Guests will be able to hire kitchen staff, and the suite has two separate entrances for this purpose, one for the staff and one for the guests. The Extreme Wow Suites look like small scale palaces. These suites have enormous suites which occupy a whole wall from the floor to the ceiling and have views towards Hollywood. These suites have a spacious master bedroom with a bed upon a dais, plush sofas below the windows, quality bed linen and a large marble bathroom with a Jacuzzi and a whirlpool bath for two. 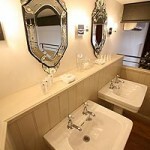 The bathroom is decorated in white and black tones and has two separate sinks and a separate shower for two. Next to it stands a smaller bathroom for guests. The suite has a living room, in the centre of which stands a large, dark sofa, and one of the corners has been converted into a private lounge room decorated with cushions thrown around a large carpet. There is a large table with faux snake leather ottoman chairs around it. These suites boast top notch technologies ranging from the huge plasma television screens to panel controlled blinds, shutters and lights. The suites also have a private kitchenette with a fridge full of gourmet food and an adjoining dining room with a capacity for up to seven people decorated in sombre tones reminiscent of Hollywood’s Golden Age. One of the hotel’s most notable features is their Whatever/Whenever service. This service allows guests to get whatever they want, whenever they want by pressing the Whatever/Whenever button on their phones. The service works 24 hours a day, 365 days a year, and some of the most extravagant wants include chocolate baths at 2am and jet service for a daytrip. 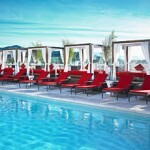 This hotel has a well known chic restaurant which specializes in haute cuisine, the Delphine, as well as a stylish VIP terrace called Drai’s Hollywood. The Living Room is a large hall where guests can enjoy a meal in a more informal setting. In a place where glamour and beauty are taken to the next level, it doesn’t come as a surprise that the hotel has a large, luxurious spa, the Bliss Spa, full of saunas, jacuzzis and massage rooms. Guests will be pampered with relaxing dull body massages, aromatherapy and chocotherapy, as well as with different skin treatments. The Great John Street Hotel is located in Manchester, one of the biggest cities in the United Kingdom. 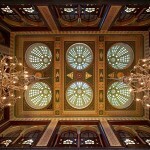 The hotel is located in an historical building which used to belong to a Victorian school. The hotel is located in the centre of the city, right next to several important streets full of shops, bars, restaurants and trendy cafés. Like most of the neighbouring buildings, the hotel is considered to be an historical building from the Victorian era. The hotel has several types of rooms and suites. All rooms have an individual style, although all rooms are double rooms with a bathroom and views towards the busy city streets. The hotel has thirty double rooms and large suites. There are five different types of rooms, all of them with a modern bathroom and bedrooms which incorporate the old school design into its contemporary chic décor. None of the rooms look like any other one at the hotel, since each space has a different theme, a different décor, different ornaments and a colour scheme which varies according to the type of room, as well as rooms decorated as though they were from a different era. There are six Baby Grand rooms. 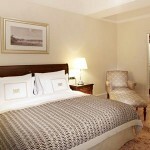 These rooms are located on the two lowest floors of the hotel. These rooms still have the original structure they had back in the day when they were classrooms, with wooden beams across the walls and ceiling. 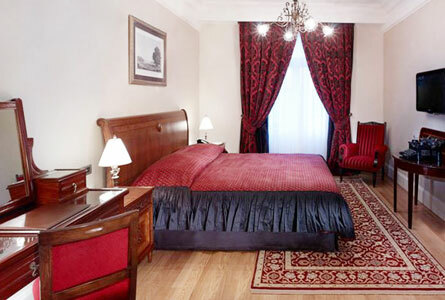 The rooms are more luxurious now, with floors covered in thick carpets and windows with colourful curtains, as well as large queensize double beds. Each room has a spacious bathroom with hardwood floors, as well as a separate shower and bathtub. The eight Boudoir Grand rooms are spacious duplexes. On the ground floor guests will find the master bedroom, a large room with hardwood floors and thick, colourful carpets. On the top floor stands the bathroom, decorated with wooden floors, a separate shower cabin and a large bathtub for two people. There are ten Classical Grand Junior Suites. The suites have a large master bedroom with an adjoining bathroom and a lounge, all of them decorated with colourful curtains. Four of the suites have bathrooms decorated in a classical Victorian style with roll top, claw foot bathtubs directly in the dormitories. The other six suites are duplex suites, with the master bedroom and bathroom on one floor and a spacious living room with a working area and a chimney on the other floor. The four Eclectic Grand suites are duplexes and are considered the largest rooms at the hotel. The rooms look more like airy lofts, with huge windows that fill the room with plenty of natural light. 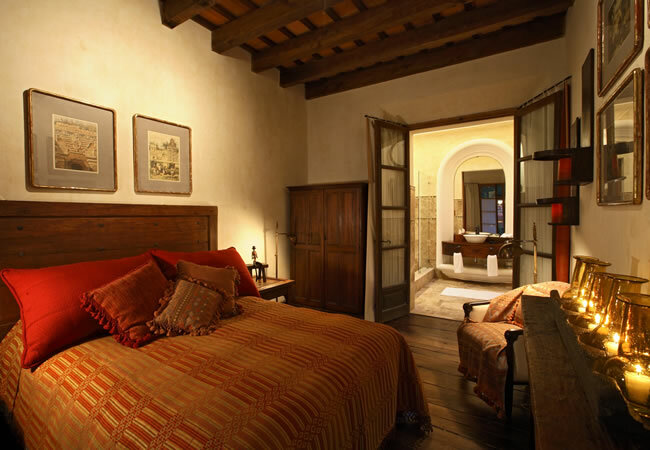 The beds in these rooms are hand carved, and the floors are hardwood. On the top floor there is a bathroom with two cast iron bathtubs, two sinks and a large shower cabin that can be used as a steam room. The two Opus Grand Suites are the most luxurious rooms at the hotel, with decorations such as crystal chandeliers, bright upholstery and big windows that fill the space with natural light and have views towards Coronation Street. On the ground floor there is a lounge area with two sofas, a table and a flat screen television. The bathroom has wooden floors, two separate sinks, a shower that can be used as a steam room and direct access to the master bedroom. On the top floor there is a guest bedroom with a kingsize bed, a flat screen television, a separate working area and an egg shaped bathtub. Price varies according to the type of room and the season, and the minimum price is 109€ per night. Price includes a delicious English breakfast and extra services such as a bottle of fresh milk brought to the room door every morning. The Oyster Bar stands right next to the hotel, and is considered to be one of the most popular bars in the neighbouring area. There are many lounges on nearby streets. The hotel can organize celebrations and events in its several conference halls and its terrace. Several conference halls can be rented out for business meetings or family events. The Roof Garden is a rooftop terrace with views towards Coronation Street and Castlefield. There is a Jacuzzi and a lounge with a private bar. The terrace holds a conference room with air conditioning and a porch area. This spacious terrace can be rented for product launching ceremonies or more formal events such as weddings. The Headmaster’s Office is another conference room, with a capacity between 24 and 50 people and decorated in dark colours with solemn furniture. The Boys’ Classroom is a more informal room with a maximum capacity between 14 and 25 people. The Girls’ Classroom is decorated in light, pastel colours and has the same capacity as the latter. 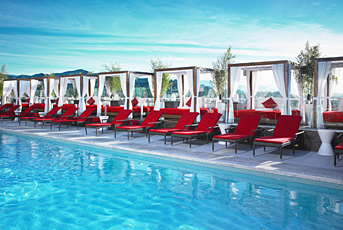 The Roof Top Lounge is the most luxurious conference room. With luxurious classical decorations, the conference room can be used both for important business meetings and cocktail parties, as well as other celebrations. It has a maximum capacity for 40 people when arranged for a conference or a dinner, although a maximum of 140 people can fit in this room for a cocktail party. 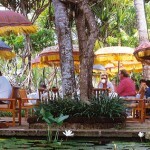 The Oberoi Bali hotel is located in Bali, Indonesia. The hotel consists of several villas standing around a set of tropical gardens with inspiring views towards the ocean. The hotel is famous for its luxurious surroundings and its pleasant atmosphere. All the villas are decorated with traditional Balinese art pieces which manage to create a harmonious atmosphere full of colour. 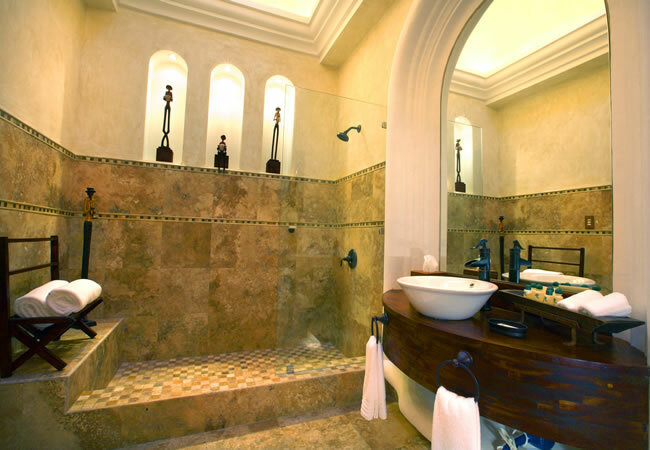 The Oberoi has several luxury villas as well as lanais constructed in the traditional Balinese style. The hotel’s territory occupies more than 15 acres of land, most of them covered by tropical gardens. Only a few minutes from the hotel is Seminyak Beach, and the villas have private swimming pools with enticing views towards the ocean. Each one of the villas has a private territory with a swimming pool, as well as satellite television, DVD player, Internet access, safe, telephone, a bar and 24 hour rooms service. The master bedroom holds a kingsize bed. There is air conditioning throughout the villas. The large bathroom has thick, opaque glass walls and sunken bathtubs in the middle of the floor, as well as views towards the private gardens. The walls of each room are covered with teak wood panels. There are several types of villas. The Luxury Lanais are villas with traditional, straw covered roofs. These four villas are built around a small pond ornamented with decorative stones. Guests can choose whether they want to sleep on a kingsize bed or if they would rather have two double beds. These rooms have a private terrace on one side, while the bathroom connects to the private, high walled garden where guests will find the sunken marble bathtub. The lanais are full of Balinese art. The Luxury Villas have straw roofs too, as well as a spacious private territory which varies between 200 and 600 square metres, depending on the villa. Each one of the villas is decorated in its own floral theme. The name of each villa alludes to a different type of local flower, and the interior décor of the villas are a reflection of that flower. Original Balinese artworks hang in large frames around the walls and all the textiles bear a flowery print. 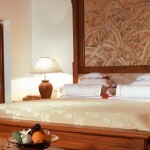 The kingsize beds have intricately hand carved headboards with flower patterns. The floors are marble, while the walls are made of teak wood. Each room has an ample closet, two bureaus, and a separate shower. One of the private terraces holds the sunken bathtub, while the larger terrace has a pond and an al fresco dining area complete with tables and chairs. The large master bedroom also has access to a private balcony. The Luxury Villas with a swimming pool are a set of nine villas with a private swimming pool each. These spacious villas have an artistic and luxurious décor and a large terrace. The Royal Villa Hibiscusa are large mansion-like villas with a private swimming pool, two bathrooms, a separate kitchen and a spacious living room. 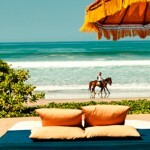 These villas have a traditional Balinese design full of wooden sculptures and bright colours. Price depends on the type of villa and the season, and is usually starts at around 298€ per night. One of the most famous places in this luxurious hotel is its very own Oberoi Spa. The spa is separated into several pavilions where guests will be able to enjoy a wide range of typical Balinese skin and body treatments. The spa has views towards a small pond with water lilies and other tropical plants. 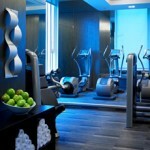 The spa offers several services, including relaxing massages, several saunas, a gym and tennis courts. There is also an open air swimming pool with views towards the sea. This hotel has four restaurants. The Frangipani Café serves a wide range of light snacks made from fresh sea food and offers continental breakfast on the terrace. The Kura Kura is an informal restaurant with an extensive menu full of traditional Indonesian food. The Kuyu Bar is a relaxing cocktail bar with stunning ocean views. The Amphitheatre is a buffet where visitors will be able to enjoy a delicious meal accompanied by traditional Balinese dancing two or three times per week. The hotel has a large conference room which can be rented out for events or celebrations. 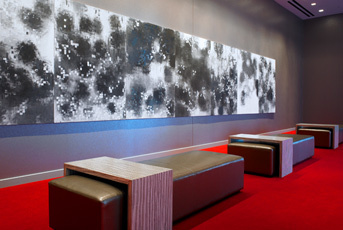 The conference room has 100 square metres available for meetings, and the seating arrangements can be arranged in several ways depending on the event, such as in theatre-like rows, around a round table or a spacious cocktail lounge. The maximum capacity is around 14 people for a meeting or 80 people for a lounge party. The conference room is equipped with fax machines, printers and audiovisual technologies. Visitors and guests will be able to enjoy many activities near the hotel, such as water sports and excursions. Guests will have the opportunity to snorkel, dive, fish, surf or sail at the nearby beaches. The hotel can organize visits to nearby towns and villages. 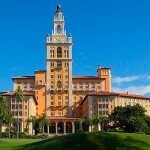 The Biltmore Hotel is one of the oldest hotels in Miami, in the United States. The hotel is filled with luxurious decorations and its architectural design is full of elaborate façades, arcs and towers. The hotel has 275 rooms, 130 of which are suites. 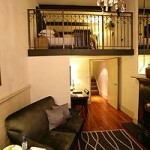 All rooms are double rooms with a queensize or a kingsize bed, a large bathroom, a television set and Internet access. There are several different types of rooms, although all of them have amenities such as bed clothes made from Egyptian cotton, stone floors and huge bay windows. Guests can choose whether they want a queensize or kingsize bed. 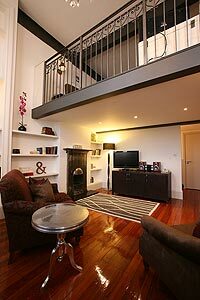 The suites have a large master bedroom with a bathroom and a separate living room with a sofa and a coffee table. The Superior rooms have a large, comfortable living room with a luxurious décor. The Deluxe rooms are even more spacious, with either a queensize, kingsize or two twin beds. The Junior Suites are larger than standard rooms, and have a separate library as well as a working area. The Executive Suite is the largest suite at the hotel, with luxurious antique furniture in the living room and a modern working area. The hotel has a large territory, complete with an 18 hole golf course, lavish gardens with walking paths, 10 tennis courts and a huge swimming pool. This swimming pool is what defines de hotel, since during the 1920’s a whole array of championships took place here. The swimming pool is decorated with tropical cascades and several private cabins are strewn around the solarium. The 2,000 square metre swimming pool is the largest in the country. 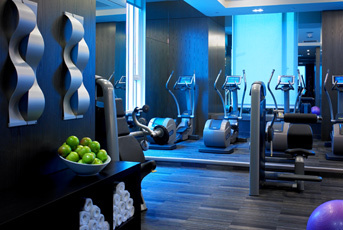 Those guests who come here specifically to relax will enjoy the hotel’s excellent gym facilities and its highly technological fitness centre. After a workout, guests are welcome for a massage at the luxurious spa. The hotel’s staff speak several languages, so guests will be able to communicate freely if they need anything. There is a souvenir shop on the ground floor. The hotel has a classic décor, with hand painted frescoes on the ceilings, marble columns across the halls and travertine floors. All furniture is wooden and the large bay windows offer guests unparalleled views towards the gardens. One of the most historical parts of the hotel is its elevator, which has managed to maintain the exact same style it had the day the hotel opened its doors. Each time the elevator needs to be fixed, a special board of directors has to agree that it is indeed in need of repair, and nothing, not one element of the original decorations, can be changed. The hotel offers a wide variety of dining options. There are four restaurants, including the Palme D’Or, the Cascade Poolside Bar and Grill, and the 19th Hole, a golf themed restaurant. The Cascade Poolside Bar and Grill is located near the swimming pool. Every Sunday the hotel offers a delicious brunch with champagne. Every afternoon, guests will be able to enjoy their tea at the Grand Lobby. The hotel offers its guests a complete catering service for any meetings or conferences that take place at the Conference Centre of the Americas. More than 7,000 square metres are available for different conventions and events. There are several halls and conference rooms equipped with all the necessary technology. The hotel is one a huge favourite for weddings and other large, festive, gatherings. With large gardens and a majestic architecture, the hotel is the ideal choice for those guests who want to celebrate any important event. The hotel can organize all kinds of events, including live concerts, cooking classes, golf and tennis tournaments and wine tastings. 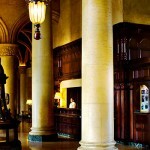 Historically, this hotel has been considered one of the most iconic hotels in the city. Even during the jazz age many celebrities stayed at the hotel, including the Dukes of Windsor, Judy Garland and Bing Crosby, amongst others. Legend has it that even Al Capone himself stayed at the best suite at the hotel. Even today guests staying at this suite will be able to observe the bullet holes left by a failed attempt to assassinate Al Capone. Even former president Franklin D. Roosevelt spent some time here, moving most of his office and advisers to the hotel during his holidays. During and after the Second World War the hotel was transformed into a hospital. The hotel is located in one of the city’s hottest spots. The hotel is only minutes away from the world famous South Beach, and only a couple of blocks away from the centre of Miami and the Coral Gables business centre. The hotel’s excellent location provides easy access to trendy bars, chic restaurants and glamorous boutiques. 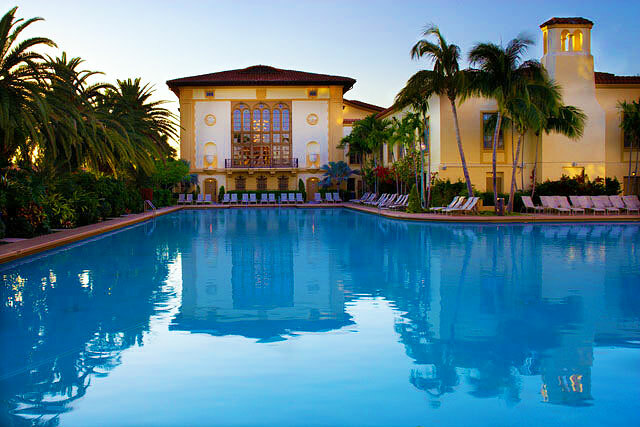 The posh Coral Gables district is full of luxurious shops and designer labels, art galleries and the most exclusive clubs. The Village of Merrick Park is another place full of many different shops and boutiques. Those who prefer to spend their breaks in the nature can visit the Fairchild Tropical Botanical Gardens, which were first opened in 1938 and house a large collection of tropical flowers and plants. The nearby Jungle Island is a bird sanctuary where guests will be able to observe many species of birds and other animals. Other nearby places include many landmarks, as well as the Miami Science Museum and the Wynwood district, a place full of art galleries and museums. 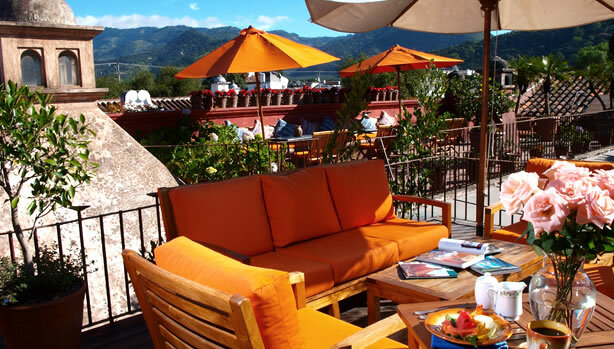 The Posada del Ángel Hotel is a boutique hotel located in La Antigua, in Guatemala. Each room at the hotel has its own theme, and the hotel itself has a traditional décor full of local artefacts and bright colours. The hotel is located in a peaceful location, and is considered to be one of the best hotels in the region, given that it is mostly known by word of mouth. This hotel is usually full of such high guests such as various politicians, musicians or artists, since its comfortable location far away from the tourist traps offers a more traditional, peaceful stay in a luxurious entourage. The hotel has 7 rooms and suites which vary in size and décor. All rooms are quite spacious, with a private bathroom and large windows with views towards the city, the gardens or the nearby natural attractions. 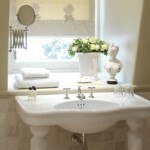 The Rose Suite is one of the most sophisticated suites at the hotel. This suite has polished wooden floors and antique ornaments decorating the walls. There is a chimney in the master bedroom and another one in the bathroom. The suite also has its own private terrace with views towards the volcanoes, and guests will be able to enjoy a breakfast with a view. The Blue Room is a colonial room decorated in several shades of light blue. 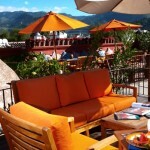 The furniture is upholstered in traditional local handwoven textiles which sport a typical Guatemalan pattern. This room can have either two twin beds or a kingsize bed. 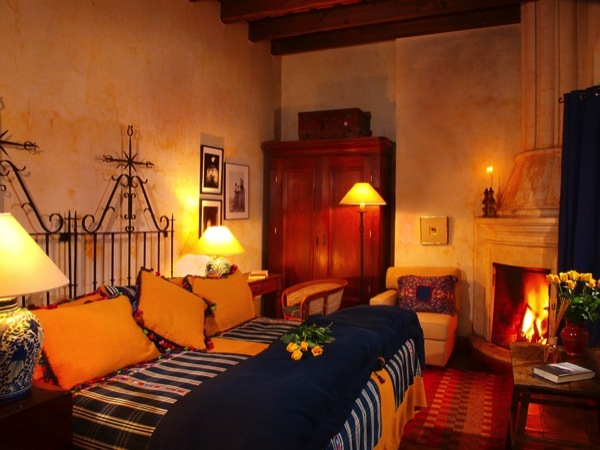 There is a chimney in the spacious master bedroom and the large bathroom is decorated in a rustic manner. Another room is the Bird Room, which can be converted in either a twin room or a double room with a kingsize bed. This room faces the hotel’s gardens. There is a large chimney and the bathroom has a rustic design with beige and terracotta walls with matching classic ornaments. The Yellow Room was designed in a bright fashion, with light furniture and views towards the swimming pool and the fountain. 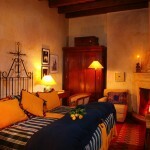 This room can be used as a twin or as a double room, and it has a chimney and a large bathroom. The Green Room has views towards the swimming pool and has a large, double, four poster bed designed in an old fashioned manner. There are several wooden bed tables crafted from a single trunk, and the room has a natural feel about it. 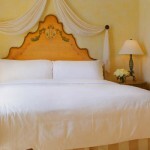 The Mayan Room has a queensize bed with an interior design reminiscent of the Mayan Empire. 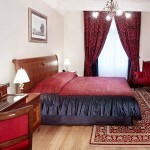 The spacious room has polished wooden floors and rustic decorations with luxurious ornaments. Most of the antique furniture is upholstered in bright coloured textiles that were woven by hand. The Marie Sue Suite is the most exotic suite at the hotel, with a queensize bed, a chimney and a separate living room with a sofa bed. The bathroom has warm wooden floors and is made from marble. 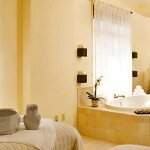 There is a large whirlpool bathtub and a direct access towards the private patio. All rooms are decorated with antique furniture, although the smaller decorative elements vary depending on each room’s theme. The bathrooms are quite large, with marble decorations and flowers. 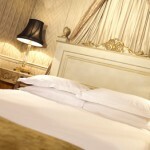 Only 600 thread count Egyptian cotton is used at the hotel, and all rooms have a relaxed atmosphere. This hotel has a swimming pool where guests will be able to relax and sunbather during the warmer days. Near the swimming pool and solarium guests will find the large dining room and a common room where guests will be able to enjoy a delicious meal inspired by local traditions. The hotel has a separate, open air dining hall as well as a terrace on the roof. This traditional yet luxurious hotel, full of hand carved furnishings and bright colours, is well known for is relaxing atmosphere. Most of the rooms at the hotel have excellent views towards the Water Volcano, a volcano standing right outside the city. The hotel has a centric location amidst historic buildings dating from the XVIIIth Century. Most of the nearby neighbourhoods remind one of 1773, and are full of large mansions and patios. Most buildings have a clear Arab or Baroque influence.